Dusting of Snow on Sapphire Berries (Digital Woodcut), a photo by randubnick on Flickr. 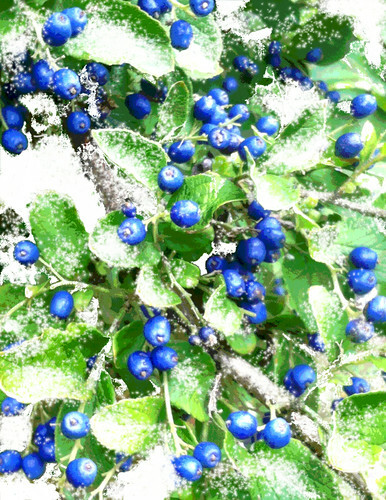 Yesterday I published my image of snow on sapphire berries. 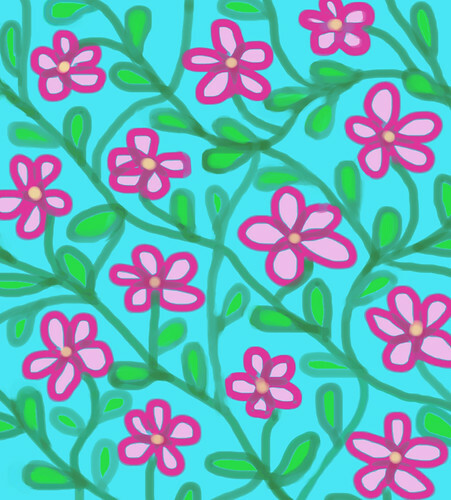 I was pretty happy with it, and have already used it to made some cards on Zazzle. But I have been wondering how it would look as a digital woodcut, so tonight I opened the image in Painter, and after a lot of trial and errors with the controls, this is the result. Dusting of Snow on Sapphire Berries, a photo by randubnick on Flickr. Today I added a little more digital snow to this image, a photo of sapphire berries that I took at Long Hill Gardens back in October (when there was no snow). I was trying out Painter's Fairy Dust brush (no kidding). It was fun to try. Now I think this might be ready. Snow on Sapphire Berries (Digitally Modified Photo), a photo by randubnick on Flickr. Tonight I decided to try adding a little snow to my sapphire berry scene (posted here yesterday). 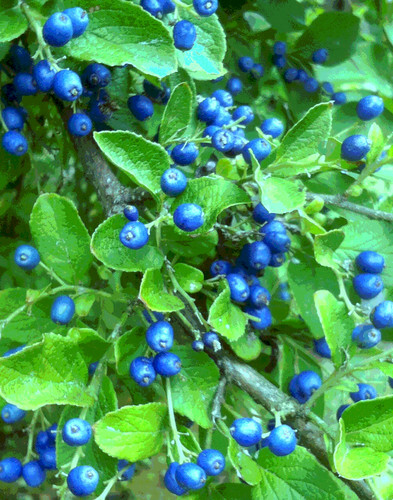 You might see this with a October snowstorm because that's when you see sapphire berries. But there was no snow when I took this picture a few months ago, so I tonight I created some snow in Painter with digital airbrush and color overlays. Then I posterized the whole image. 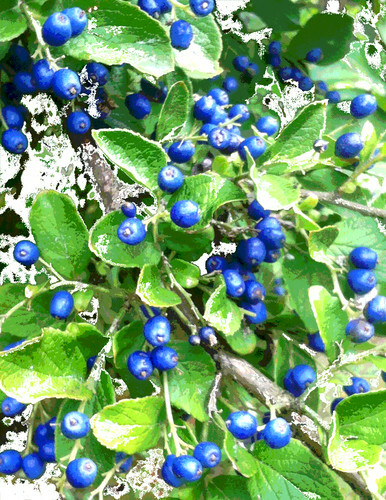 Sapphire Berries (Posterized Photo), a photo by randubnick on Flickr. I had a request for a greeting card with a photo of sapphire berries. So tonight I found a photo that I took during a walk at Long Hill Gardens in October. I wanted a cooler color scheme, so I adjusted the color to add a bit more blue, and added color overlay to yellow areas of the leaves. Then I posterized it. I like the blue-green color scheme. 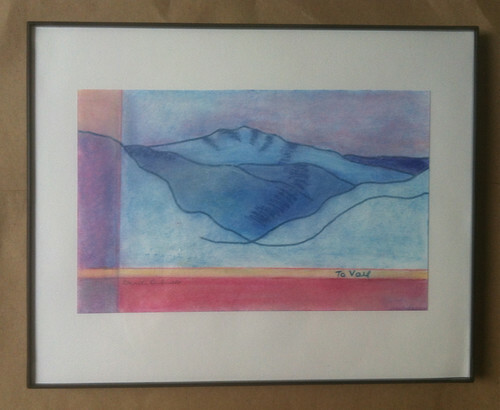 Colorado Drawings: To Vail (Framed), a photo by randubnick on Flickr. Here is the second of two pieces that I framed yesterday. Both were small drawings, part of a series of drawings based on my old sketchbook from a trip back to Colorado in the 1980s. These were small line drawings of the mountains, sometimes with the place noted. Recently I have been copying the sketches into a new sketchbook and adding color. 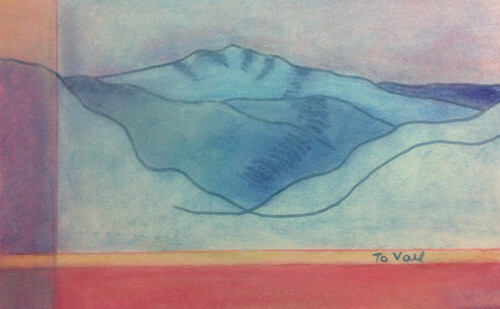 This one is called "To Vail". It is only 5 x 8 inches. Today I delivered this piece and the one that I posted here yesterday to the gallery at Porter Mill because they are going to be shown in the "Small Works" show. 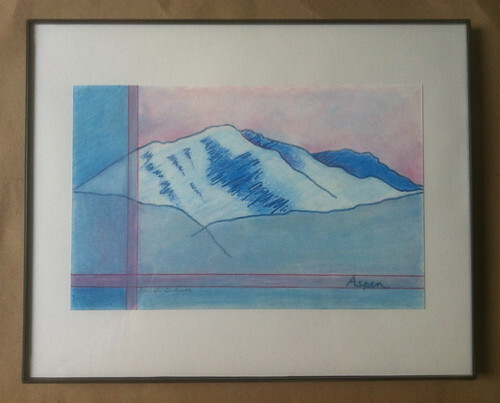 Colorado Drawings: Aspen (Framed), a photo by randubnick on Flickr. Today I framed two pieces that are going into the Small Works Show (in the gallery at Porter Mill Studios.) I need to drop them off tomorrow. Both pieces are "Colorado Drawings" from the series I am working on. (These are drawings based on a sketchbook that I took along on a trip back home, back in the 1980s.) 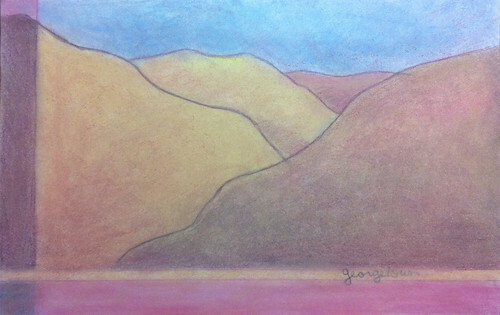 This one is "Aspen," and the drawing itself is only 5 x 8 inches. Branches and Berries, a photo by randubnick on Flickr. Two days ago I posted a little digital painting of berries on a branch (created in Painter with digital gouache). 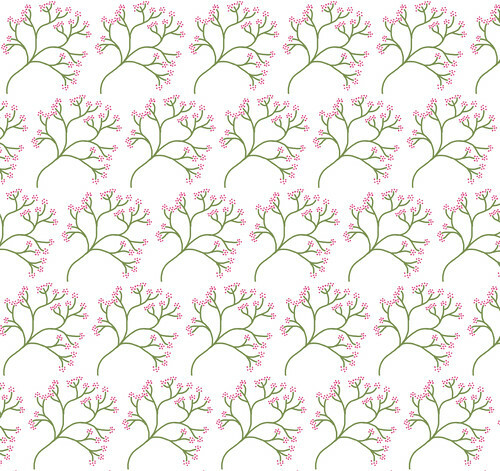 I have been wondering what the image would look like as a pattern, and tonight I decided to find out. I "captured" the pattern in Painter, and then filled a new image with it, using the paint bucket tool, fiddling with the controls until I got this image. Colorado Drawings: Georgetown (version 2), a photo by randubnick on Flickr. 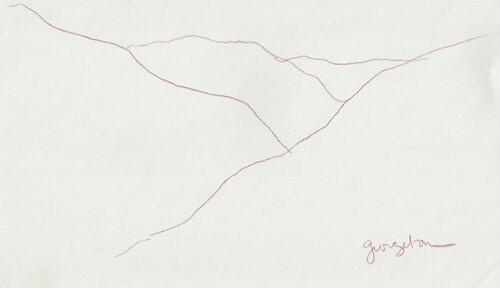 I am working on a series of small drawings based on quick sketches of the Colorado mountains. On a trip back to my home state in the 1980's, I took along a small 5 x 8 inch sketchbook and when I was in the passenger seat, I pulled it out and made simple line drawings of the mountains. I often noted the rough location. I have been copying those old sketches and adding color with dry media. This drawing is based on a sketch I made near Georgetown, Colorado. (The sketch is posted, November 10, 2012). I made an earlier version of this last week (posted here November 16, 2012). The color scheme is similar, but I prefer the composition of this one because the lines of the mountains are higher up on the page.. Branch with Red Berries (Digital Gouache), a photo by randubnick on Flickr. Tonight I made this little digital drawing with Painter's digital gouache, just concentrating on a simple pattern with lines and dots. Here north of Boston, most of the bright fall leaves are gone. The consolation is being able to see beautiful red and orange berries on some of the trees. 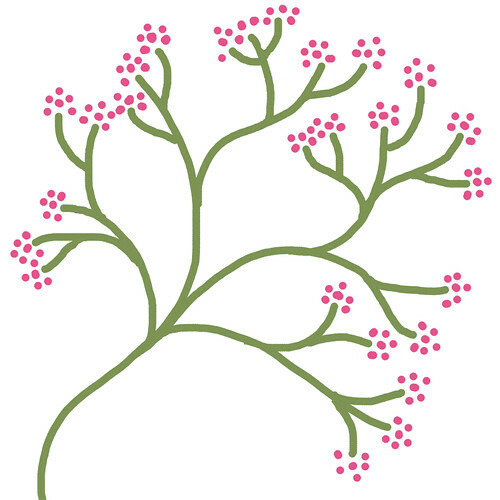 This is a little playful celebration of a branch with red berries. Orange Oopsie Daisies (Digital Print), a photo by randubnick on Flickr. 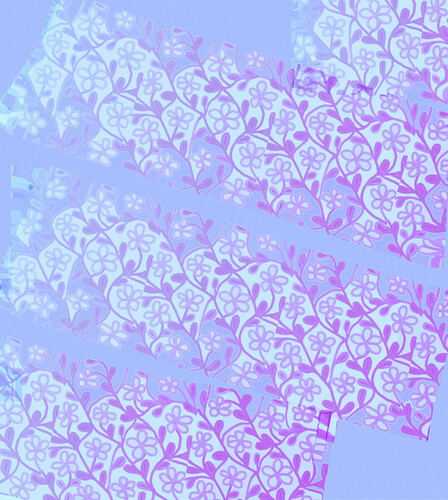 Tonight I decided to make some more images with this pattern (created from my little digital drawing called "Oopsie Daisies). I used Painter's pattern pen and chose a very large size for the digital "brush". Then I put the pattern on by moving the mouse, and it reminds me of using a brayer. Then I posterized the image and added some selective color overlay to balance out the composition. 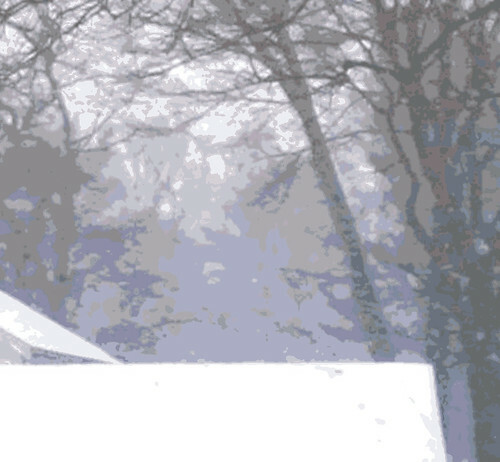 Roof Top and Trees in Snow Storm (Digital Woodcut), a photo by randubnick on Flickr. Hopeful Menorah, a photo by randubnick on Flickr. What am I doing posting a menorah? 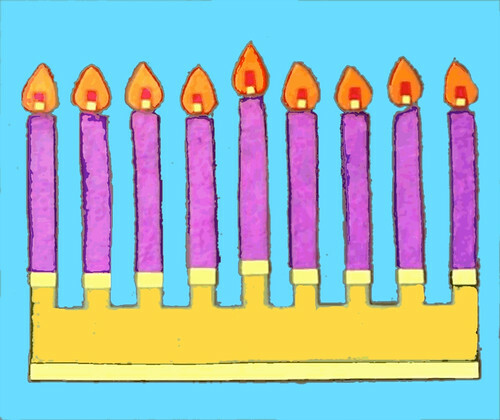 It seems too early to think about Chanukah, but I want to make some cards, and have to get on it pronto! Tonight I searched my images for "menorah" and found one of my favorites, a simple collage of a menorah, posted here December 15, 2006. But the background color wasn't right for a card, and besides, the resolution is too low and dimensions are too small to upload to Zazzle, which is where this is headed. So I opened the image in Painter and resized it. Then I used some digital pastel to change the background to blue, and added some outlining with selective color overays. Then I posterized the whole thing at a low level just to bring the resolution up. So maybe this the right time for a menorah: a little more light, a little more freedom, a little more hope for peace. Digital "Print" with Daisies, a photo by randubnick on Flickr. 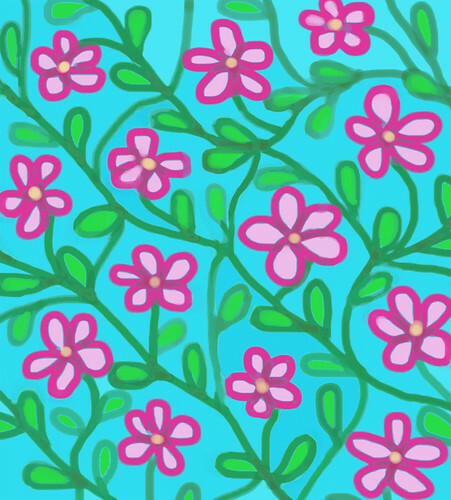 Earlier in the week, I worked on a digital drawing called "Oopsie Daisies" (final version posted here on November 14.) 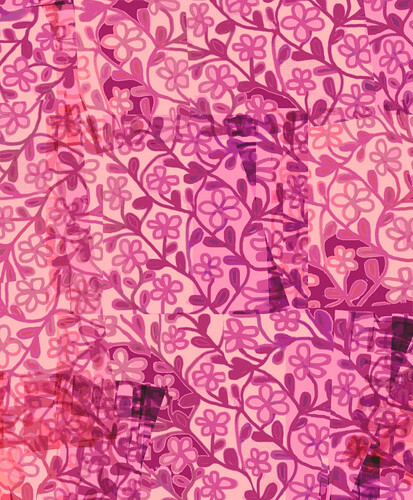 Tonight I decided to see how it would work as a pattern, so I opened the image in Painter 12 and "captured" it for my pattern library. Then I used it to create this image, using the largest size brush possible, so I can roll the pattern on as if it were a brayer. When I had the strokes where I wanted them, I used the magic wand control to add color overlay that included the plain areas of the "canvas" as well as part of the background of the pattern. Then I posterized it and cropped it to get this image. Sunset from Lynch Park, a photo by randubnick on Flickr. This is a photo that I took at Lynch Park on Wednesday, around 4:20 PM. We were out doing errands, including a stop at the Beverly Cove Community Center to pick up fish from our fish CSA By then, the air was chilly and it was already getting dark, but we were minutes away from the park, so we stopped to walk the dog. The minute I parked the car, I saw this sunset and I was glad we came. Our dog seemed to agree, suddenly becoming uncharacteristically bouncy and playful in the sand. She is a 14-year-old Schipperke, and that doesn't happen very often, so it was clear that we had made the right decision. 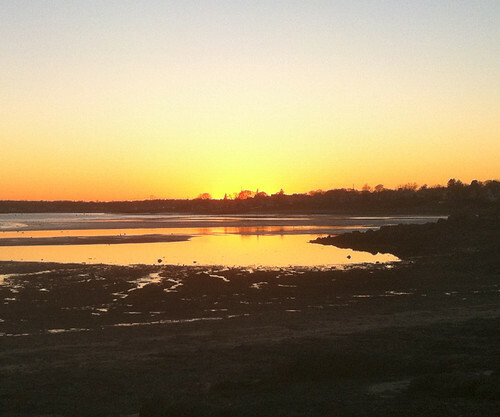 I took this photo from the beach in the cove, looking west, back toward downtown Beverly. Tonight I used iPhoto to do some basic editing and cropped the photo to get this composition. Colorado Drawings: To Georgetown, a photo by randubnick on Flickr. Tonight I finally had a chance to get back to drawing, part of a project I am working on. I am making a series of little drawings based on an old sketchbook that I had with me on a trip through the Colorado mountains back in the 1980s. I made very quick sketches from the passenger seat of a moving car, and sometimes noted approximately where we were (Georgetown, Colorado for example). I am scanning the original pencil sketches into my computer, printing them out and tracing the lines into a new sketchbook, and drawing back into the sketch with pastels, conte crayon, marker, etc. Last week I scanned the original sketch into my computer and posted it here (on November 10th). Today I traced the image into the new sketchbook and started adding color. This is what I came up with. I like this one, though it still needs some clean-up. I did a lot of work to get the colors right. Even so, I may try to do another version because I would like to get the mountains higher up on the page (as in the original sketch). 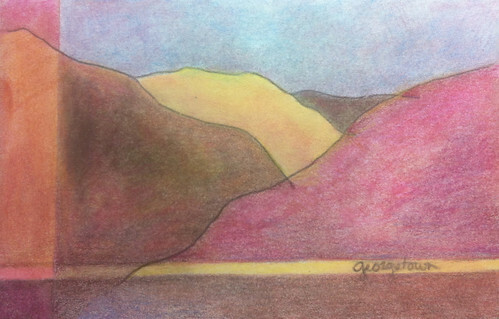 Sketch of Pink Mountain (Digital Sketch), a photo by randubnick on Flickr. Last night I downloaded a new iPhone app called "Paper". It has simple drawing tools and allows you to choose simulated papers, ranging from graph paper to rice paper to brown paper bag. I think it is really meant for writing hand-written notes or sketching out ideas (graphs, etc.) I saw a video demo some time ago (at least I think it is the same program). I think it will work well for making quick (rough) sketches of ideas for paintings, as well as for sending handwritten notes to people. But tonight I decided to see if I could use it to draw. So I went to my standard "try-out" mode for such situations, and drew a mountain. I was happy with the result, although I still can't figure the controls. Anyway, I did figure out that I can transfer the image into my computer and save it as a jpeg. I like it and it is always good to have another tool, but for drawing, it's hard to top the Brushes app. Oopsie Daisies (Final Version), a photo by randubnick on Flickr. I promise that this is the final version of this digital drawing! Tonight I opened the image in Painter 12 again and used digital pastel to clean up some more of the mistakes that were bothering me, fixing things like petal shape and size, leaves in the wrong place, etc. I worked on it for almost an hour and I cleaned up a lot of problems. There are a lot of mistakes left, of course, but I am not shooting for perfect. With all their flaws, I am partial to these little daisies. I might use them on Zazzle. Oopsie Daisies (Revised), a photo by randubnick on Flickr. Tonight I worked on the image that I posted here yesterday, a digital image that I made with Painter 12, using digital pastel. Although I liked the little drawing, there were a lot of mistakes, so I called it "Oopsie Daisies." Tonight I opened the image in Painter and fixed some of the mistakes that were bothering me (and created a few new ones in the process). So these are still "Oopsie Daisies" but improved just a bit. It was fun, and good practice drawing with the mouse. Don't know if I am done, but I do know that I am done for tonight. Oopsie Daisies, a photo by randubnick on Flickr. This is a digital image that I made on the computer tonight with Painter 12. I wanted to unwind and started this drawing with digital pastel. I kept going longer than I intended. 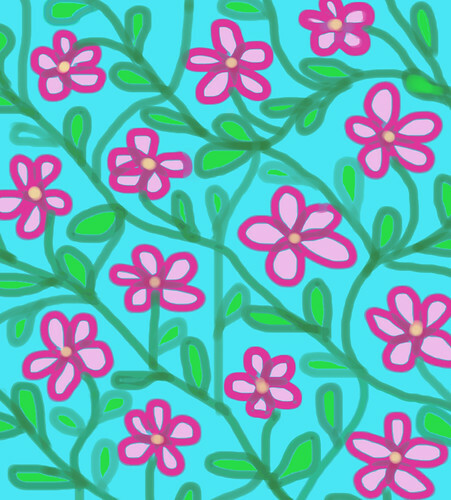 There is something that I like about this little flowers, even though there are lots of mistakes. Hence the title. 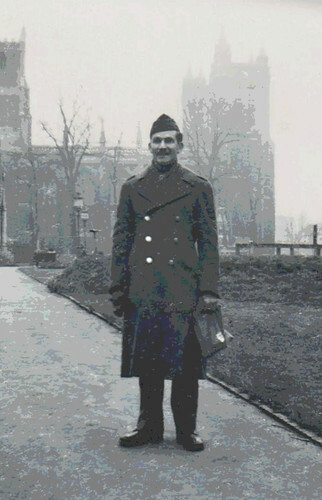 Dad in England WWII (Rescued and Posterized Snapshot), a photo by randubnick on Flickr. This image began with a snapshot that I found in my mom's old album today. She married my dad right before he went overseas in 1943. While he was away, she created a photo album with the pictures he sent to her, as well as the photos that she took back home in Pueblo, Colorado. During the war he was stationed in England and in France. There are little clues in the pictures about what he was doing with the military: in a foxhole, in front of a tent, holding ammunition. But most of the photos he sent my mom were the lighter side of the experience: playing accordion and piano for the army band, and seeing London during some time off, as in this photo. No doubt the photographer was one of his army buddies. Today I scanned the photo into my computer and used iPhoto to do some basic editing and retouching, and then used Painter 12 to posterize it. So here's to my dad on Veteran's Day. And here's to all those dads, uncles, granddads, moms, sisters, daughters, sons who have gone off to war. Colorado Sketchbook Georgetown (Brown Pencil), a photo by randubnick on Flickr. This is a sketch that I made during a trip back home to Colorado during the 1980s. We drove through the mountains, and when I was in the passenger seat, I took out my small (5 x 8 inch) sketchbook and made quick contour drawings of the mountains as they flew by. Sometimes I noted where we were (Georgetown, in this case). I came across that old sketchbook sometime last year and decided to create a series of drawings based on the sketches, adding color with dry media. Tonight I decided to make a drawing based on this sketch. The first step is to scan it into the computer. I make a PDF to print out. I keep the image the same size so I can then trace over the printed copy, using graphite paper to make a copy in a new sketchbook (this one also 5 x 8 inches). And I also make a jpeg so I have a good digital image of the original sketch. With this one, I had to do a little digital cleanup to remove some stray marks. I used brown colored pencil in the original drawing, and I like that, but I also used iPhoto to create a black and white version, just in case. Tomorrow I hope to start the drawing. 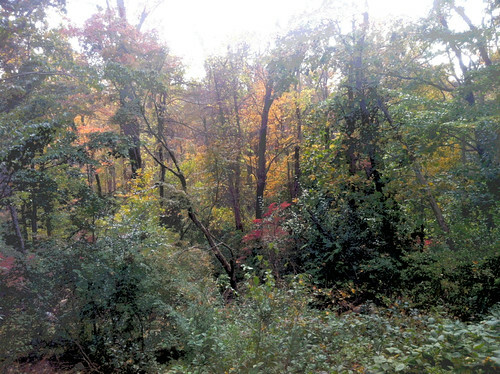 Red Leaves in the Woods (Posterized Photo), a photo by randubnick on Flickr. Colorado Drawings: To Vail (Version 2), a photo by randubnick on Flickr. This image is part of a series I have been working on, new drawings of the Colorado mountains based on line drawings from an old sketchbook that I took along on a trip to my home state back in the mid-1980s. My travel sketchbook was small (5 x 8 inches) so I could take it out when I was in the passenger seat and make quick sketches of the mountains as we drove along. Sometimes I would note the location. So I have been scanning those old sketches into my computer, and generating copies that I can trace into a new sketchbook (also 5 x 8 inches). (The original sketch is posted here on September 12, 2012.) Then I draw back into the sketch, adding new shapes (horizontal and vertical lines) as well as color, with marker, colored pencil, and colored conte crayon. This is the second version I have done of this sketch; you can see the earlier version posted here on September 14, 2012. Well, I still like the earlier version. In this new version I changed the placement of the vertical and horizontal lines to put more emphasis on the shapes of the mountains. I also added some warm yellows and that old Colorado dusty rose. Leaves in October (Posterized), a photo by randubnick on Flickr. This image started with a photo that I took back on October 21 during a walk at Long Hill Gardens, here in Beverly, MA. 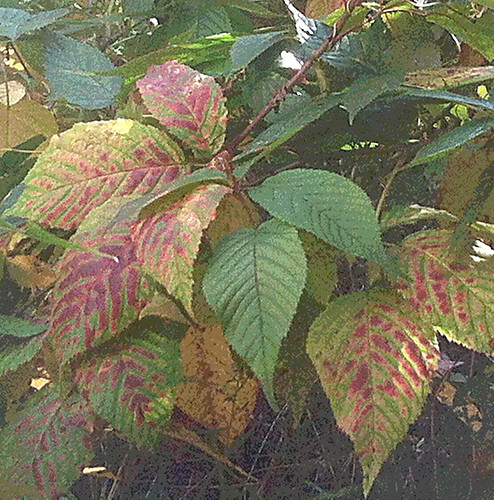 I saw these interesting leaves, so I took a picture. Tonight I used Painter to posterize the image and then cropped it to get this composition. 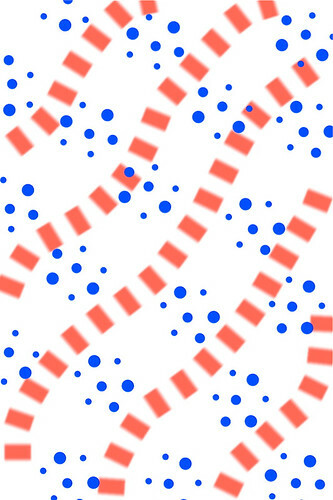 Patterns in Red, White, and Blue, a photo by randubnick on Flickr. While I was watching election results tonight, I got out my iPhone and created this little digital design with the Brushes app. 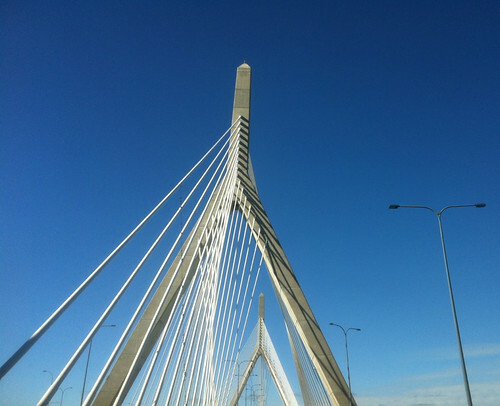 Driving on the Zakim Bridge, a photo by randubnick on Flickr. We had a house guest over the weekend. On Sunday, we had brunch in Cambridge, did a little shopping (bookstores and for me, the bead store), and then drove to South Station where our friend was catching the train. I was in the passenger seat on the way home, so of course I tried to take a picture of the Zakim Bridge as we drove north, back to Beverly. I love that bridge so I try to take a picture whenever I can, even though I usually fail. But I had good luck with this shot. Tonight I did just a bit of cropping in iPhoto. Cloudy Sky, a photo by randubnick on Flickr. 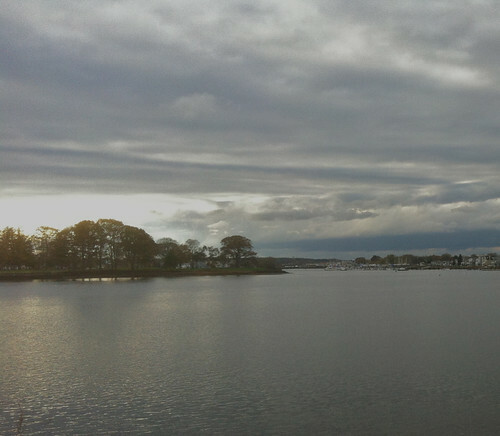 On Wednesday (October 31), we took a late afternoon walk at Obear Park, here in Beverly, MA. There were several trees down from the big storm, and the sky was very cloudy. This is one of the pictures I took. Tonight I edited it in iPhoto and cropped it to get this composition. Chicken Collage, a photo by randubnick on Flickr. 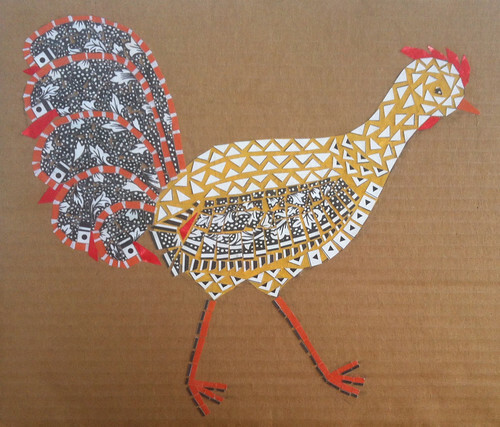 Yesterday I went up to the studio to work on this project, an image of a chicken created out of patterns. (This idea came to me while I was looking at some real live chickens over at Long Hill Gardens.) The last time I worked on this project, I finished the body and tail of the chicken. But I wanted to make the legs look sturdier, so I added the pattern of black dashes on the legs. Apart from a little cleanup, I think this is finished now. (Although I can never be sure. . . .) I am glad this is finished, but I will miss working on this chicken because it always made me smile. Mom Reading a Letter (Posterized and Rescued Snapshot), a photo by randubnick on Flickr. This image started with a old snapshot from a batch of photos that my aunt sent to me this past month. These pictures were all from my mother's old photo album, pictures taken of her as a young woman. Many of the pictures were before she met my dad and got married, and some were soon thereafter. And most of the photos I have never seen. Did she put the album away because there were a lot of pictures of her old boyfriends in there! Any, quite a treasure-trove. 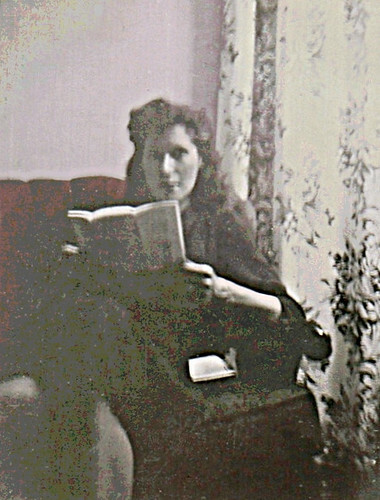 This morning I looked through them and found one that I really liked, of my mother sitting in a chair and reading a letter. There is no date on the back, so I don't know when it was taken. But in the forties, obviously, and in our old house in Pueblo, Colorado. Was the letter from my Dad? I like to think so, but she had other boyfriends, obvious from the pictures. Like many of these snapshots, the photo itself is about 2" x 3". I liked the composition. (I don't know who the photographer was, but I am guessing it was my aunt or my grandmother) but the photo was out of focus and it had scratches and marks on it. I wanted to rescue it, so I scanned it into my computer, did some basic retouching and cropping in iPhoto, and then opened the image in Painter. I sharpened the focus a bit and then added some color overlays and posterized by sections until I had what I wanted. I am doing this by way of marking my mother's birthday, which would have been today, November 2. My mother didn't have a clue that she was beautiful. Bright Flowers, a photo by randubnick on Flickr. 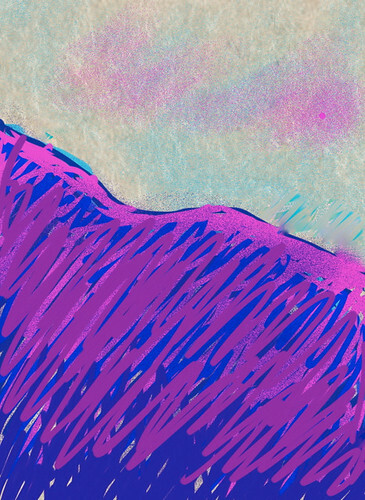 I started a little drawing in Painter 12 tonight, with digital pastel. I just wanted to unwind and sketch for a few minutes. 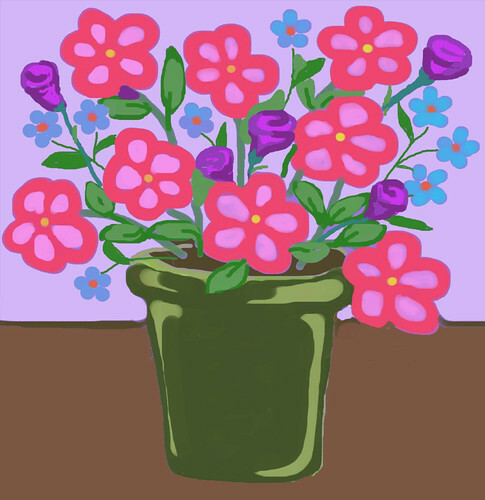 So I started drawing something out of my imagination, a little bouquet. I was enjoying myself and so I kept going, and this was the image after about an hour's work.